Once fired Hornady 22 HORNET brass sold in 100ct quantities. Once fired Hornady 223 brass sold in 100ct quantities. Once fired Hornady 300 Winchester Magnum rifle brass sold in 100ct quantities. Once fired Hornady 308 MATCH rifle brass. Sold in 100ct quantities. 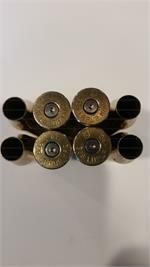 Once fired Hornady 375 Holland & Holland Magnum rifle brass sold in 50ct quantities. Once fired Hornady 375 Ruger rifle brass sold in 50ct quantities. Hornady 7mm-08 yellow once fired rifle brass. Sold in 100ct brags. Once fired Lapua 338 Lapua Magnum rifle brass. Sold in 50ct bags. Once fired 280 Ackley Improved Nosler Custom brass. Sold in lots of 100pcs. Nosler 6.5-284 once fired rifle brass. Sold in 100ct bags. Once fired PMC 308 Win non-crimp primer rifle brass. Sold in 100 count quantities. Once fired Remington 223 Rem CRIMP PRIMER rifle brass. Sold in 100pc. quantities.